Rebels in Syria have announced a big offensive aimed at breaking the government siege of east Aleppo. A UK-based monitoring group says rebels fired "hundreds" of missiles on western Aleppo, killing at least 15 civilians. In response, Russia's defence ministry asked permission from President Vladimir Putin to resume air strikes against the rebels after a 10-day pause, but he denied the request. About 275,000 people have been besieged in the east of the city for months. Russian and Syrian government planes began bombarding the city in September. More than 2,700 people are said to have been killed and injured since then. Russia suspended its air campaign on 18 October to allow evacuations of sick and wounded people but few have heeded the call to leave. The Russian defence ministry said continuing civilian deaths and an upsurge in rebel activity had prompted its request to resume the strikes. However, Kremlin spokesman Dmitry Peskov said Mr Putin did not consider it appropriate to restart the strikes but said the humanitarian pause should continue. Meanwhile US officials have confirmed reports that a Russian fighter jet and a US-led coalition plane were involved in a near miss over Syria on 17 October, coming within half a mile of each other. There is an element of political theatre to all this. Russia's military was first to act, announcing that it was asking President Putin's permission to resume air strikes. That is not strictly necessary but it allowed Mr Putin to decline and, in doing so, stress his humanitarian credentials. Acutely aware of accusations it has committed war crimes in Syria, Russia wants to re-cast its image as a force for good. It dismisses the claims themselves outright. But there are signs this extended pause in the bombing campaign may be short lived. Russia still reserves the right to support the Syrian military in case of "extreme need" or "provocation" - which could be anything. And when Russia's foreign minister met his Syrian and Iranian counterparts today, all the talk was of intensifying the fight against terrorists. If the West is only conducting that fight with words, Sergei Lavrov said, then Russia is determined to finish the task - in practice. The attacks are so far coming from rebels outside Aleppo but it is understood that rebels inside the city will join the offensive. "All the revolutionary factions, without exception, are participating in the battle," the military spokesman for the Fastaqim faction inside the city said, AP news agency reports. They include Jabhat Fateh al-Sham, formerly the al-Qaeda-linked Nusra Front, as well as fellow Islamists Ahrar al-Sham. 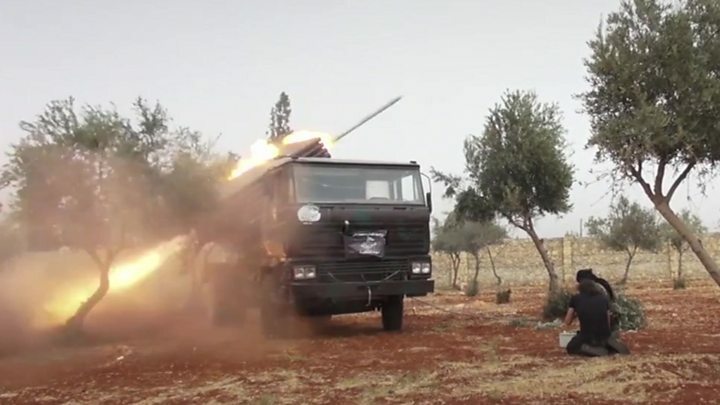 Rebels fired Grad missiles at al-Nayrab airport, the Syrian Observatory for Human Rights (SOHR) monitoring group said. Up to 115 people were killed or wounded, it added. They also detonated two car bombs against government positions to the south-west of the city. The BBC understands that parts of south-western Aleppo have been captured by a group from outside the city. However, the Syrian government said it had repelled offensives on several fronts around Aleppo by both rebel groups and militants from so-called Islamic State (IS). "Booby-trapped cars, two tanks and a large number of armoured vehicles" were destroyed, the defence ministry said on its website. The area around the Hmeimim air base near the coastal city of Latakia - the main airport used by the Russian air force - was also reportedly targeted by rebels, the SOHR said. The rebel offensive came as Syria's foreign minister Walid Muallem met his Russian and Iranian counterparts, Sergei Lavrov and Mohammad Javad Zarif, in Moscow. Mr Lavrov reiterated Moscow's call for moderate rebel groups to disassociate themselves from Jabhat Fateh al-Sham. He quoted US Secretary of State John Kerry as saying if this did not happen the moderate groups concerned would be considered a legitimate target. "I think... the time has come for the logic set out by John Kerry to find some practical shape," he said. It is the rebels' second attempt to break the Aleppo siege. In August they temporarily opened a corridor between the east and west after the government entirely encircled them for the first time in July. The city, previously Syria's economic hub, has been divided between the two sides since 2012.